The fundamental goal of the L.I.S.T. Balance System is to create a mind-body connection through a series of holistic strength exercises performed in a destabilized environment. When these exercises are performed across multiple planes and vectors, in a full range of motion, the bodys total musculature is activated. The L.I.S.T. Balance System is a holistic training program designed to strengthen and empower our mind, body and spirit. The foundation of the L.I.S.T. Balance System is understanding the nature and function of the bodys core, the concept of core stability and core training. The core is located in the midsection and is the bodys center of mass, gravity and energy. In yoga this is the location of the first, second and third chakras representing stability, sexuality, vitality and personal integrity. These are core psychological components that are essential for good mental and physical health. A well conditioned core is the foundation for a vigorous, active lifestyle. That's what Karl is to training. The cores muscle groups (i.e., waistline musculature and pelvic floor) are designed to support, control and stabilize the trunk and spine. As the bodys center of gravity, it is the foundation for all movement. 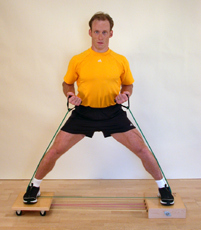 A weak core will result in an unstable foundation and will adversely effect every movement of the body. In addition to producing poor posture, a weak core significantly increases the potential for injury. Conversely, understanding and activating a persons core will unlock the true energy potential of the human body and promote the functional unity of all muscle groups. The core is located in the midsection and is the bodys center of mass, gravity and energy. In yoga this is the location of the first, second and third chakras representing stability, sexuality, vitality and personal integrity. The purpose of core training is to strengthen the muscle groups that support the trunk, pelvis and spine. Regular conditioning of the core muscles is vital for stability and efficient functional movement patterns. Combined with neuromuscular coordination, sound core stability is the cornerstone of superior athletic performance. 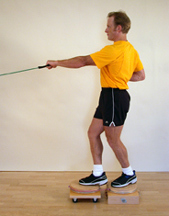 Pilates Box - standing hip abduction with arm function. Increases core functionality. 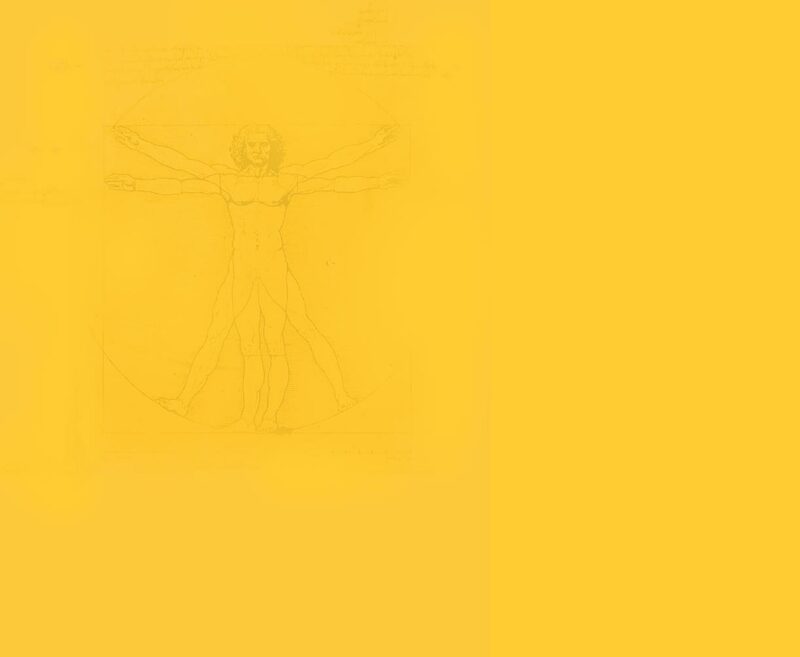 The human body is designed to move in a number of directions in a wide range of vastly different environments. We also have the ability to simultaneously perform a wide range of multiple tasks. These could include the multiple physical and mental tasks of running and throwing, or hitting a baseball. In addition to the physical requirements of swinging a bat, the athlete must interpret key pieces of information, in a fraction of a second, to determine the type and location of the pitch being thrown. To accomplish these tasks, the body is moving through multiple planes while coordinating and activating numerous intellectual and neuromuscular processes. These combinations of variables occur, to varying degrees, in all physical activities. The purpose of Accurate Multi-Planar Exercise (AMPE) is to train our bodies to perform in the complexity of a three dimensional physical environment. This requires a strong, flexible body capable of a wide range of movements and dynamic neuromuscular coordination ready to respond efficiently to the physical challenges of our constantly changing surroundings. 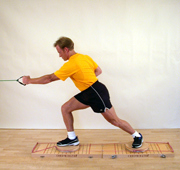 Core-dinator - pull and push with rotation and lateral weight transfer. Improves timing and strength, decreasing the likelihood of injury. The parallel of AMPE in the mental and emotional realm is Present Moment Awareness Training (PMAT). While the concept of PMAT may sound somewhat esoteric, it is the single most important element of the L.I.S.T. Balance System. PMAT is essential if you are to develop the focus, determination, discipline and awareness necessary for optimal mental, physical and emotional health. By mastering PMAT, you will develop full focus, that is the ability to devote 100% of your energies to the activity taking place in the present moment. By staying within the present moment, you will be able to focus your attention on the issue at hand, whether it is exercise, problem resolution or any other activity. With your full attention, the task will be performed with a much higher degree of commitment, thought and awareness, greatly increasing the chances for success. reverse lunge with rotation. Dramatically improves core function. In the L.I.S.T. 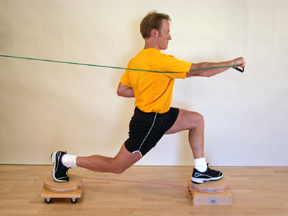 Balance System, full focus is achieved by incorporating balance into an exercise program. 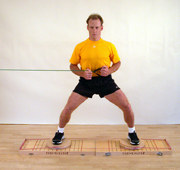 Performing a familiar exercise such as a lunge requires little concentration. 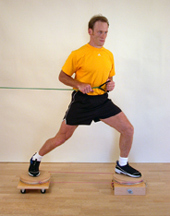 Performing the same lunge on an unstable foundation such as the L.I.S.T. Pilates Box changes the dynamics of the exercise dramatically. 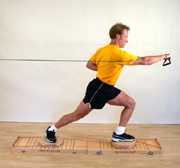 In addition to utilizing more muscle groups in varying combinations to execute the unstable lunge, the user must now devote the necessary mental concentration to maintain balance throughout the exercise. The result is a dramatic increase in mental and physical acuity that traditional training programs do not provide.